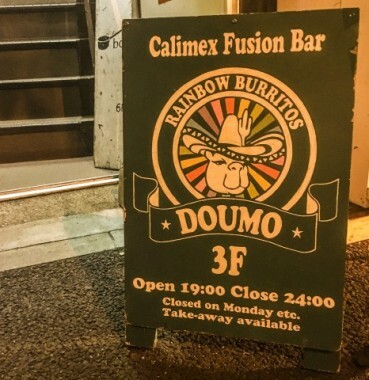 Rainbow Burritos: Doumo is a tiny bar in a building at the intersection between Shinjuku-nichome, Shinjuku-sanchome and Shinjuku Park. Ascend the steep stairs of the building to the third floor and pull open the wooden door to find a cozy atmosphere. There are four counter seats and one corner table that can comfortably seat four to five people (more possible with a little squishing). A long counter runs the length of the space, and may be used either for seating or for placing bags, depending on how busy things are. 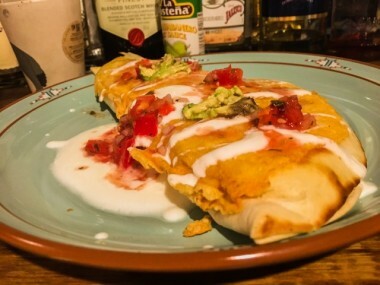 Rainbow Burritos offers a straightforward selection of six California-style Mexican dishes: burritos, tacoritos, quesadillas, chimichangas, tacos, and nachos. Diners can choose small or regular size dishes; regular size items (¥800–1000) are large enough to be considered a meal in themselves, and small size items (¥500–700 yen) are great if the appetite is low or if sampling is in order. Nachos come in small, medium, and large sizes. The simplest offering is a soft taco (grilled chicken and onion in a flour tortilla) at ¥300. The lone side dish is chips and salsa (¥300). 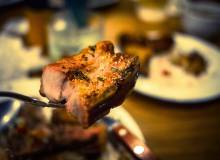 While the menu is limited, it is made such that variation is possible. Each item (except nachos) can be prepared with chicken, beef or veggie fillings. All dishes except the tacorito can be made vegan for an extra ¥100. Order more than ¥500 worth of food for a ¥200 discount on drink orders. Frozen margaritas are made to order in a blender. Served in a salt-rimmed glass, the tequila is noticeable but not overpowering. Depending on the staff member working, this drink may vary in degrees of smoothness (and may or may not come with a slice of lime). The chips and salsa features a house-made fresh salsa. The flavors are mild but refreshing, with the primary bite coming from chopped red onion. Fresh tomato adds heartiness and oregano gives it a light herbal taste. It’s not chunky—there’s quite a bit of liquid— rather, it’s a light accompaniment to the toasted and salted tortillas chips it is served with. The tacorito is a large portion suitable for one person; thin slices of beef with sautéed onion and lightly spiced rice are folded into a large flour tortilla (which is heated in a rice cooker just prior to use). A mild cheese is spread across the top, and staff use a blowtorch to melt the cheese across the tortilla. This is then topped with house salsa, avocado, and a little bit of Mexican sour cream (also made in-house). The result is something surprisingly not heavy, though the sautéed onions and rice have a pleasant oily fattiness about them. The dish is lacking in spice, so to add some heat, make generous use of the bottles of habanero sauce provided. 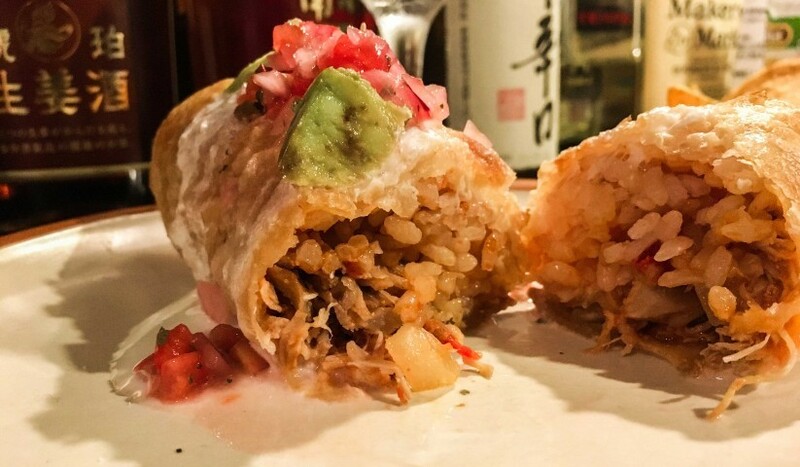 The chimichanga (essentially a fried burrito) is undoubtedly the most exciting item on the menu. Although the tortilla is fried until crispy, it maintains a surprising degree of lightness. Cutting into it reveals a rice-onion-meat combination. The shredded chicken used for the filling was pull-apart tender (though habanero sauce was needed to maximize enjoyment). Highly enjoyable with the avocado, salsa and Mexican sour cream toppings. Burritos feature the same variation on the filling theme (main + rice + onions) and are served wrapped in tin foil. In addition to food and drink, the shop aims to offer a space where people of all different walks of life can gather comfortably. Rainbow Burritos actively participates in LGBTQ events and warmly welcomes people of all sexualities, genders and countries. The original owner of the shop became familiar with California-style Mexican food through her relationship with her Mexican-American girlfriend. While weeknight visits tend to be subdued and there are fewer customers, the bar can be quite crowded on weekends, with the small table in the back sometimes housing lively, open discussions. Bilingual staff members warmly welcome new visitors. 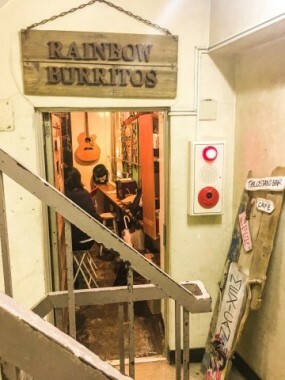 Rainbow Burritos is a great spot to drop in for a short bite when out for a drink in the neighborhood. 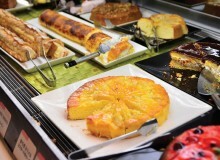 The menu is certainly limited (in terms of spiciness and options), but what is on offer is honest and free of excess. 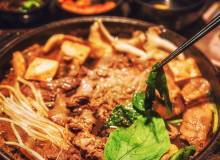 Ingredients come from places like halal shops in Shin Okubo. Prices are extremely reasonable for such large portions. It’s easy to visit alone, but not recommended for a group, as there’s very limited space and only one staffer working at a time. Check the shop’s Twitter and Facebook pages for their monthly schedule, which will include any special events. Takeout is also available. Do yourself a favor and stop in for their chimichanga the next time you get hit with a burrito craving.